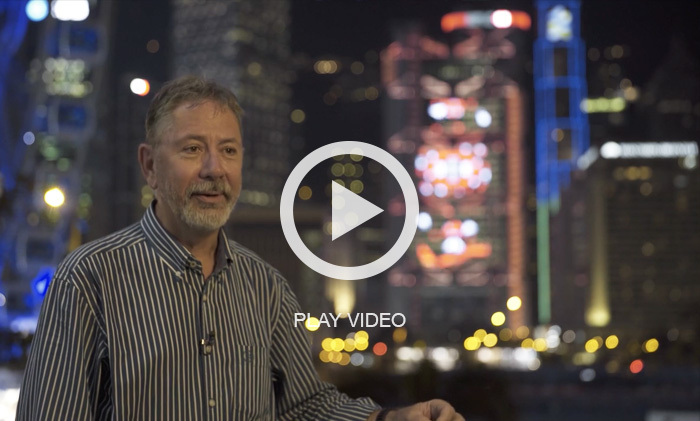 In 2015, Simon McCartney (iP Co-Founder and Director of Design) was interviewed about the Digital Makeover of HSBC’s Headquarters in Hong Kong. illumination Physics was commissioned to help bring to life the first wave of HSBC’S 150th anniversary messages. A complete update of the façade lighting and the integration of three large media walls followed, as these tools would collectively be a vehicle for communication and deliver the most visible of the bank’s celebrations. Three powerful media walls were needed as the messages being displayed were complex. No static display could achieve the goals. The illumination Physics design for the media wall equipment was to create a system that would be invisible during the day to avoid any negative effects on the appearance of the building. Furthermore, the media wall content needed to be legible from both a close distance of 100 metres and from the opposite side of Victoria Harbour 2-3 kilometres away. The media walls seamlessly integrated into the glass façades between the refuge floors. These walls range from 880 square metres to 1,100 square metres and consist of 2,652 of illumination Physics’ custom made ‘IP Glass Media' strips which utilise a total of 217,464 RGB LED’s. Lighting and, for the first time, media content have been combined to create a greater spectacle by displaying more meaningful images which relate to Hong Kong itself. This combination has further enhanced what is already a remarkable skyline. This was a project that could only occur in Hong Kong and with one building – a serendipitous collision of place, cultures, technology and architecture. Subscribe to our email newsletter to receive all the latest illumination Physics news and products. Please note that gmail accounts may not be accepted, or may be emailed to get further information.